Read the full article in Czech here. Accolades of Iva and her work continue to abound. The February edition of Ona Dnes, the Czech Republic’s most popular women's magazine, included a five-page article of an interview with Iva. 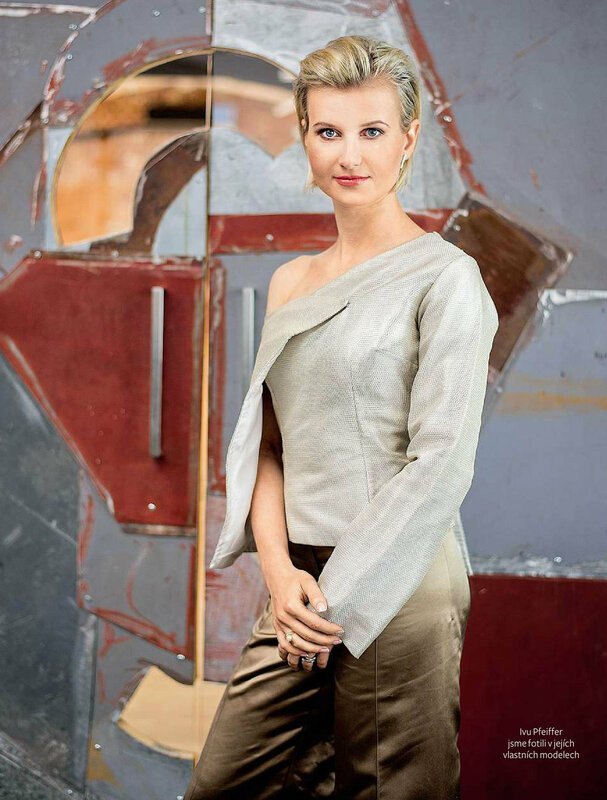 Full of insight into Iva's professional background, the article discusses the leaps in her career, her creative inspirations, and her philosophies and visions for Iva Pfeiffer Creations and the fashion industry. It also includes photos of Iva and others modelling creations from three of her recent collections, and a photo of traditional block-printing techniques that Iva learnt from her time in India and incorporated into her collection entitled Translations: Moving Between Cultures. Not only was it an honor to be featured, it was also a wonderful birthday present for Iva, because the edition came out on her birthday...and featured a stunning photo of her on the front cover! Iva said, "Ona Dnes does a wonderful job of celebrating women's achievements, and I feel incredibly honored to be interviewed by them. Many thanks to Lucie Silhová who was generous and fun to talk to, and Petra Pikkelová for her sensational photographs."